With the appointment of the new Provincial Senior and Junior Grand Wardens having taken place at Blackpool, both were invited to introduce themselves to our online readers and tell us a little more about themselves. David Edwards and his wife. David Edwards, PrSGW wrote: “I was initiated into Freemasonry in the Blackpool Temperance Lodge No 5303 early in 2010 and was installed as master in January 2016. I am a joining member of Baines Lodge No 7844 in the South Fylde Group of Lodges and Chapters and was installed as master in December 2017. I am also a joining member of Lodge of Peace and Unity 314 in the Preston Group, currently serving as junior deacon. Additionally, I am a member of the Senatores Lodge of Installed Masters No 8966. In the Royal Arch, I am a member of the Fylde Chapter No 2758 in the North Fylde, currently serving as second principal. I am also an active coordinator of the Fylde Light Blues Club. I was born in Stoke-on-Trent in 1979, moving to Lytham St Annes in 1986, where I was brought up. I was educated at King Edward VII School in Lytham St Annes, and after initially graduating at University in Politics, I converted to Law and qualified in 2007. I am interested in cycling, golf and football, and still try to get out on the bike, when time permits. I also enjoy listening to percussive electronic music. 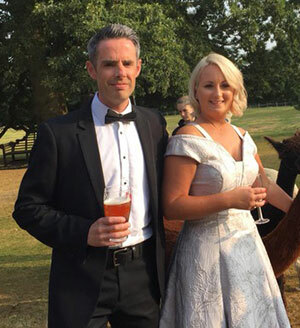 My wife and I also enjoy travelling, and her unfailing love and support enables me to thoroughly enjoy my Freemasonry, and I am thankful not only to her, but also to my proposer and seconder into Freemasonry, and indeed all of those who have supported and encouraged me ever since my initiation, including my parents, John and Jenny. Paul Storrar, PrJGW wrote: “I was born in Chester 44 years ago and spent much of my childhood and early years there. Indeed, as an independent financial advisor I have a small practice in the city. I used to do a lot of rowing and spent several years coaching but decided to take a break from the early mornings. Now I sit on a bike in the gym (often learning ritual). I was appointed as a magistrate four years ago and have just become a deputy chairman of the Cheshire Bench. I was encouraged to join Masonry by a school friend who had moved to London, who thought it might appeal to me. His father was a Mason in Liverpool, so I quizzed him, and it turned out that a family friend and near neighbour was in the same lodge. He arranged for me to meet a few more members of the lodge and they must have approved as I was initiated into St George’s Lodge of Harmony No 32 in the Gladstone Group in 2006. I went into the chair in 2013 and my father was initiated into the lodge in 2014.